As the premier holiday and event decorating company in St.Louis, Holiday Lighting STL professionals are well recognized as the "Go-to" Holiday Decorating experts in the all of the markets we serve. We evaluate and map residents' property, listen to their desires, and create holiday lighting and decorating plans that accentuate the unique features of their home and its landscaping. Our professionalism is truly second to none and our decorators are well versed in the requirements of a world class holiday installation. We work with commercial grade decorations, so they look better for longer than anything you will buy at the store. The best part is you will not have to deal with the box of tangled half burned-out lights in the garage. You will immediately notice the difference in our products as we go to great lengths to ensure that only the very best products are used on your property. We have done all of the homework to ensure your display is safe and that your property stays shining bright throughout the holiday season. Our goal is to create a “remarkable” holiday experience for you and your loved ones. Our service can really "un-complicate" and simplify your life. From our design and installation to our pro-active maintenance to our removal and storage of the decorations -- Holiday Lighting STL is your best choice! We know you want your home decorated correctly, promptly and with the greatest attention to detail - that’s exactly how we work. We look forward to YOU becoming one of our valued clients! Decorated Family Program - Holiday Lighting STL provides free holiday decorating to military families who's loved ones are serving overseas. 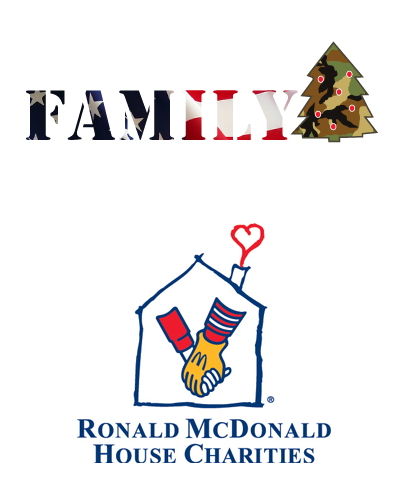 Ronald McDonald House - Our holiday decorators provide decorating free of charge to Ronald McDonald houses throughout the USA in order to provide a bright holiday season for families who are going through a tough time. Local and Regional Charities - Our local offices participate in multiple local and regional charitable organizations throughout the USA. ​Special Circumstances - Our employees have a heart to give back to the community and families who are in need.